Anita and I getting ready to tackle the tower of seafood at the 360 Restaurant in the CN Tower. Last night I did something I've been wanting to do since I moved here in 1989, eat at the 360 Restaurant at the top of the CN Tower. Rob really didn't have any interest in going so I invited a girlfriend who had never been either. We had decided what we were going to order not long after I had made the reservation after checking out the menu online. 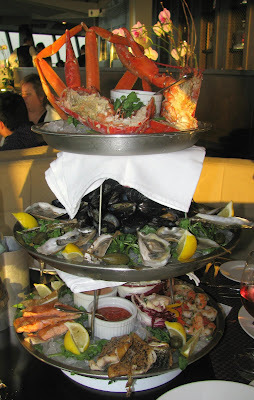 Both being seafood lovers we ordered "The 360 Towering Platter of Seafood", and what a tower it was! We were the centre of attention as 3 waiters paraded to our table, each carrying a platter of seafood. Neighboring diners even took pictures of our meal! The 360 Towering Platter. 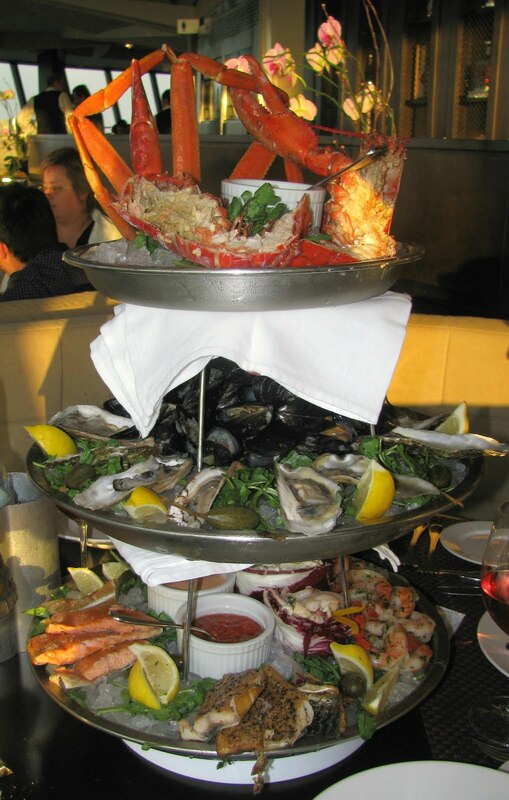 A chilled three tiered platter of fresh Canadian seafood. We enjoyed most of the seafood immensely, except for the oysters, they we're disappointing. The top tier was a 1.5lb split lobster, with a half a pound of crab legs. The second tier was 1 dozen Malpeque oysters with 2 dozen marinated PEI Mussels. The bottom tier was smoked salmon, trout and mackerel, Bay scallop, baby shrimp and calamari salad, one dozen jumbo shrimp and some potato salad. We were there for over 2 hours, but alas, cannot say we were able to finish it, but we definitely got our full of seafood. Anita had to stand up to get the food off the top tier, we couldn't see it sitting! I should say something about the restaurant itself. The elevator ride up is always fun, and no waiting in line because your going to the restaurant. It wasn't the intimate fine dining experience I was expecting, it actually seemed very "touristy" to me, which makes sense. The decor seemed dated and could do with an upgrade. But the view is spectacular and I would definitely go again, especially if I had company from out of town. 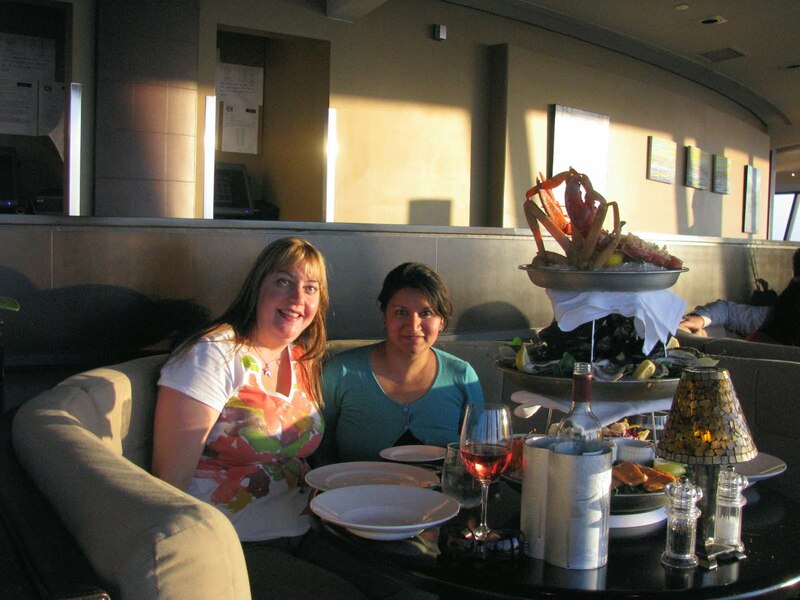 It takes 72 minutes for a full turn of the revolving restaurant, and the view is amazing all the way around. We went up when it was still light, and left when it was dark, stunning views. We were there on a night before a Full Moon, and it was an incredible sight to see. This picture does not do the breath taking view we had of the almost full moon justice. 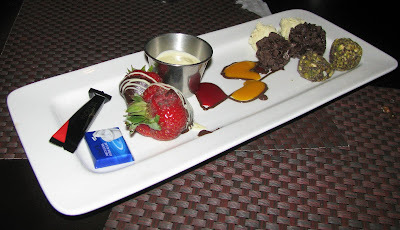 We felt like something sweet after all that seafood so we shared the truffle platter. It was quite the experience, and I am glad that I finally went. It's the perfect place to take people visiting from out of town for a memorable evening out. It's been a few years since I've had a fun meal there. I can't believe they have a seafood tower! And though you couldn't finish it, you had dessert?! Ha! The tiered tower we tackled was a sight to behold!